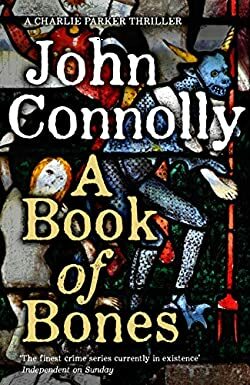 Reading the John Connolly books in order is akin to traveling down a road filled with very disturbed, slightly supernatural, poetic and often gory and gruesome passers-by. Here are the John Connolly books in order for his series, standalone novel and his short stories. The list will be updated with new books as the author published them. John Connolly (website) is the Irish author of his popular Charlie Parker supernatural crime mystery series set in Maine, US. He was born in 1968 in Dublin, Ireland. He studied English at Trinity College, Dublin, where he got his BA, followed by an M.A. in journalism from Dublin City University. Before becoming a full-time author, he held several odd jobs, such as being a barman, a waiter, a low-level clerk at Harrods in London, and a freelance journalist for The Irish Times newspaper, where he remained for 5 years. While no longer employed there, he still contributes articles and interviews other authors every now and then. His work in the field of journalism was a stepping stone to his following career as a mystery author. In fact, he wrote his very first novel, Every Dead Thing (which turned out to become the first Charlie Parker book) while he was still freelancing as a journalist. The book got published in 1999, setting course to a successful career with many books to follow. It received the 2000 Shamus Award for Best First Private Eye Novel and was nominated for the Bram Stoker Award for best first novel. John Connolly is the only non-American author to receive the Shamus Award, and the first Irish author to receive an Edgar award. Once John Connolly fully embraced his book author career, he started writing in earnest, having written to date over 20 books included in 3 series and several standalone novels, many winning various literary awards including the Barry Award, the Agatha Award, the Anthony Award, and the Edgar Award, and others being nominated for several more. His short story, The New Daughter, included in Nocturnes, the supernatural story collection, was the base of a movie with the same title featuring Kevin Costner and Ivana Baquero. The author is mostly known for his Charlie (Bird) Parker thriller series, featuring the ex-cop ex-PI troubled guy who has his very own demons to battle while also fighting the evil that tries to destroy the world, one person at a time. You know, those sadistic serial killers who prey on the innocent and torture them to unspeakable lows before killing them without mercy. I truly got hooked on this author’s writing with the very first Charlie Parker book, called Every Dead Thing. I have read it several years ago, and just now recently went back to read it again along with rest of the series to eventually catch up to his latest novel, published this year called A Time Of Torment. Most of the John Connolly books have elements on supernatural in them, and early on, the author drew heavy criticism for them from critics. Still, he didn’t give up and continued to add supernatural to his Charlie Parker thriller series. While the books are set in the US and the author is living in Dublin, Ireland, the author does bring in some elements from him in his stories in the form of folklore, the uncanny, and the supernatural part of the fiction. Some books have quite strong elements of folklore within the pages. Besides the Charlie Parker Series, John Connolly also wrote several short stories, edited a nonfiction book of essays on writing by several other authors, and with He, in 2017, he departed from his usual genre by creating a promising reimagined fictional biography of Stan Laurel. A delightful novel full of humor and biographical tidbits for every lover of the Golden-Age comedy. Charlie Parker was once a cop with the NYPD. Now, he is a tough private detective – some might call him an occult detective. Still, he never uses the occult and the paranormal in explaining the various loopholes in the stories. His past is dire, and he learned the hard way that real evil exists. He accepts it, and he has learned to deal with it. His dark past comes to us right from the start, in the first book – Every Dead Thing – when his wife and young daughter were tortured and killed while he was away binge drinking. Ridden with guilt, he leaves his job at the NYPD and begins working as a PI. Behind the cases he takes on, however, there is one thing he can’t stop thinking about: finding the one who destroyed his family. A man called The Traveling Man. After leaving New York, he retreats to Maine, where he begins working in earnest as a PI with the help of his supernatural comrades Louis and Angel. Love all the books I have read so far. Just finished A Game Of Ghosts. Left me wanting more. Please don’t let anything happen to Angel or Louis. They are two of the best secondary characters I have ever read. They are right up there with Archie Goodwin. I love the Charlie Parker novel, I listen to them on audible books. Sad the [cut out by moderator to avoid spoilers] in your latest book “A game of ghosts”. All the characters work great in your books, I have enjoyed your latest book it is up there with “The wrath of Angels”, “The black Angel” and “The lovers”. Great writing.